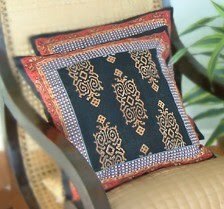 Pure Style Home: Giveaway & Reader Discount from Saffron Marigold!! Giveaway & Reader Discount from Saffron Marigold!! 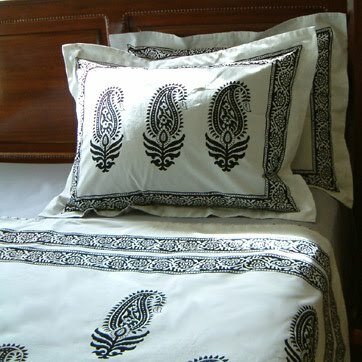 READER DISCOUNT: Archana has also generously offered all of our readers a 10% discount for linens. Just place an order and enter "PureStyle" in the comments section at checkout. To enter for a chance to win the giveaway, click on the left sidebar to become a flollower of Pure Style Home and leave a comment after this post. If you want an additional entry/ chance to win, you can tweet this post and be sure to let me know in the comments. (I just joined twitter and there's a link for it on the left sidebar... I'm trying to get the hang of it so let me know if you can find me & I'll follow you too! :) I'll be picking a winner randomly Wednesday, August 25th & will post the winner by that evening. Ha! I've managed to avoid spit up to the face/mouth so far, but it's only a matter of time. I love Saffron Marigold products. They are so beautiful! Gorgeous! I love all the prints! Wow, thats a big splat. Too Funny. What gorgeous prints those are. I love the paisley. Thanks for the chance...they are beautiful. I love these products! Thanks so much for the chance to win. Thanks for sharing....these are great prints. Gorgeous prints - I love all of them! Oooooh. Love alll of their goodies! I would love any of their prints. Thanks for the giveaway! The linens are gorgeous! guess each of us have gifts to give. I sort of miss those spit up days and sleepless nights. well we have the sleepless nights with teens. I have admired these gorgeous linens for a while. So pretty! Thanks for the chance to win. I love the crisp clear quality of these prints! Count me in! These are all gorgeous - the tablecloth would be awesome! I love these designs! Perfect for my dining room! Thanks for offering this giveaway! Beautiful! I'd want them all! I love all of their pieces! Would love to have the pillow covers. These are gorgeous! I'm already a follower! I'm a follower! Love those prints! I am a follower and really enjoy your blog. These are really lovely prints! My favorite is the first one. Looking forward to checking out their site as well. I am following your blog and I just love reading it. 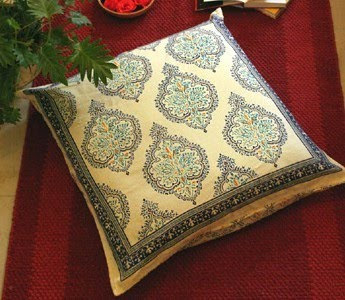 Your house is beautiful and I love paisley fabric too! have a great weekend. LOVE, LOVE LOVE Saffron Marigold - all of their prints are awesome. I would love to have some of them in my home! That last picture is so cute (and funny). You'll be glad you caught that on film some day! Welcome to Twitter, I will be sure to follow you! How beautiful. I would love to have a tablecloth! 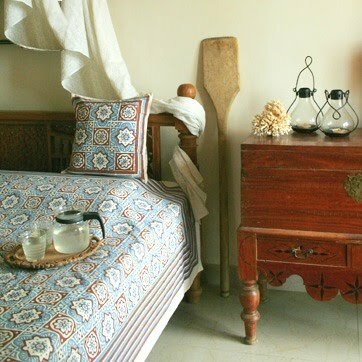 I just love blockprinted linens and their selection looks wonderful! Thank you so much!! I haven't heard of Saffron Marigold before - thanks for the introduction to really cool items! Oh, I love them...especially the marigolds! Thanks for a chance, great giveaway! I just tweeted the giveaway too (@inthetweeds)! These are awesome!! I added you in facebook and tweeter! I subscribed! And I love this stuff. So beautiful! I love the covers! I am a follower. I love their linens!! I'm a follower. I love these designs! Beautiful! I'm now a follower - love their prints, and your blog! Ooohh la la! I'd pick the tablecloth, it just seems like you could do so much with it. such pretty things and I course I already follow you! Ah...the joys of parenthood. Enjoy it for these are fleeting moments! love all these patterns!!!! gorgeous! What beautiful paisleys! I'm re-designing my living room/dining room, tring to get them to coordinate - a table runner would really help! Thanks for running the contest,Lauren! love that block print paisley. gorgeous! They're all beautiful! It's hard to pick a favorite. 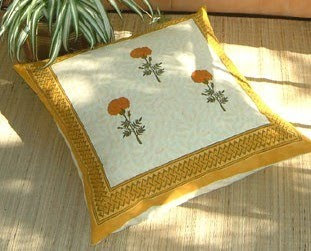 I am a big fan of Saffron Marigold, their stuff is just so pretty. Just beautiful - I love them all. Please count me in and I will check out her site. We are having a big birthday party at our house this weekend and last night as I was setting the table (a Martha Stewart idea to do it in advance that I LOVE!) I was thinking that I need more colour on the table...! P.S. Oh dear, poor Dave. Not so amazing some times, is it? I can stop fantasizing that it is all roses now. Such gorgeous prints, I would love to win! Following though GFC and on Twitter. And I tweeted the giveaway, yay! Oh my gosh! That pic of your hubby is hilarious. Poor him. Such beautiful patterns! I love them! Beautiful prints! I love them all. :) Great giveaway. I love Saffron/Marigold's products. They come so beautifully wrapped. 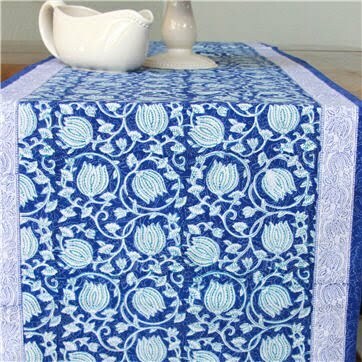 I have the blue and white guest bed done in the pattern you are showing as a table runner. I knew I loved your blog! so pretty - I love all of them. I could really use some new linens for my table. I've been looking for an affordable block-print duvet cover. these are perfect. I went on their website, I want everything!!! Gorgeous!! Thanks for the amazing giveaway (and discount!). These linens are so beautiful! Thanks for the great giveaway. what a great giveaway. love block prints! the table runner is my pick. cute pic of the family too! I'm a fellow block print and paisley lover. Thanks for introducing me to these... and thank you for the giveaway. Loving this line! 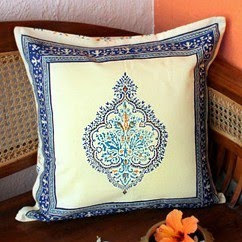 I'd love to use the cushion covers in my daughter's room that we are re-decorating! these are gorgeous. i would love to win. Wow, all of their designs are SO beautiful! Thanks for the giveaway! I am now following you with GFC and on Twitter. Thanks! 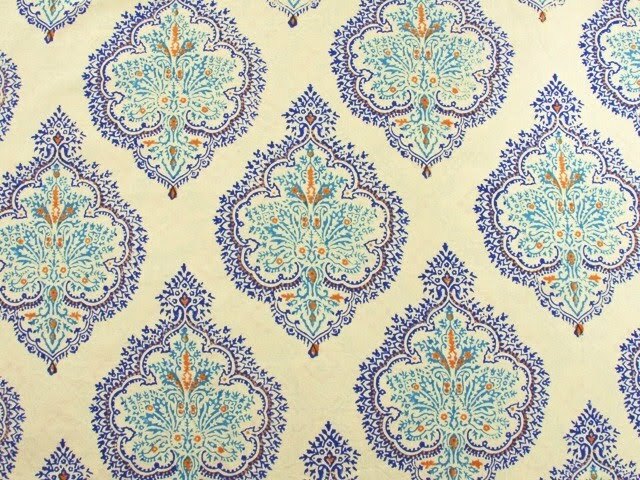 I'm a follower of course, and just LOVE these printed fabrics. Thanks for the chance to win! Love their products! The intricate designs are just beautiful. How exciting! Thank you so much for the chance to win. I just love reading your blog. You have a ton of inspirational ideas! what an awesome giveaway! i would love to have some of these pillows in my house. count me in! These prints 'feel' so fresh! Love them and love your blog. Thank you? So cute! I love the black and white! I just Tweeted about this giveaway! Would love to enter this contest.... they would fit perfectly in our new home! Ahhh! How gross (I have yet to reach that famed status called motherhood...)!! I've been loving your blog as an avid follower for some time, but must post as I love Saffron Marigold toooooo much! Delicious patterns! Lauren, thanks for the great pix of the patterns--great resource. Please include me in the give-away offer. And thanks so much. I'm learning so many things from you---Love it! i love their table cloths! Absolutely stunning fabrics!! I'm a follower and keeping my fingers crossed!! Love all of the fabrics! I am a follower. Oh, so gorgeous! What a fabulous and generous giveaway! Such beautiful things! I'd have to choose the tablecloth. They are all so beautiful. And that's why it is always good to have your camera ready. Love those prints. So pretty, fun & funky all at the same time! I've been following for a while! These are gorgeous and I'd *love* to win! I am a big fan and a follower. I would love to win!! Wonderful blog and such lovely prints. You are not fully a parent until you have gotten it in the face/mouth. I love that he sat there long enough for you to take the photo! I just officially joined as a follower after following for several months now! Love the prints. ooh!!! so pretty! !I love the first print. Thanks for the great giveaway and i hope you are enjoying your weekend. I thought I was already a follower, but discovered that I wasn't! I always stop in by way of a link on my blog, so I didn't realize! I had never heard of Saffron Marigold either, and I just took a look at their site. I am amazed at the low prices for fabric that is HAND PRINTED. It's amazing! Thanks for the discount deal, and the chance to win! You are the first blog I have ever followed. Your blog makes me exited and inspired to further beautify my life. I especially liked your admission that you love stuff. My mom and sisters lean toward minimalism, and detachment. I felt slightly embarrassed to enjoy the "loving of stuff". You, a person who obviously has an eye for beauty, made me feel like it was acceptable and can complement spaces. Strangely, by accepting that it is okay to love stuff, I feel like the standard for what I want to surround myself have become more celebratory of my life and tastes. I am really glad I came upon you when I googled "boxwood balls" and your blog was mentioned within another blog. Thank you! I'm new to this blog and am loving it so far! Thanks! Such beautiful prints, perfect for summer! Love the prints, especially the paisley in the first pic. I love these pristine linens. Thank you for sharing...I am HOPING for a tablecloth!! Love, love, love the prints! My fingers are crossed. I am a loyal follower. I wasn't familiar with this company before. Thanks for the discount! I've been eyeing a few of their runners lately. Gorgeous. Just tweeted about this! Just gorgeous, gorgeous fabric! Beautiful prints! Love your blog! What a good sport Daddy is, to sit and let you take a picture of him! I have always loved the detail of the ivy lace cloth. Lovely contest, and I am a follower! Just back from vacation and catching up on my favorite reading! (love the German fish print). These block prints are beautiful and look so crisp and clean. My favs are the first and last. I follow and subscribe! I am officially a follower now. Such prettiness!! Thanks for the fun giveaway! Such pretty fabrics! And ....oh gross!